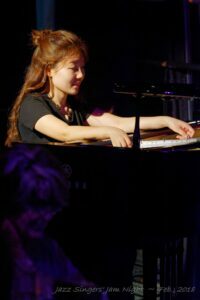 Brisbane International Jazz Festival (BIJF) presents a double bill featuring the Zac Hurren Quartet and a solo piano performance by Sophie Min. A Jazz graduate of the Queensland Conservatorium, Griffith University, Zac Hurren is a magnificent tenor saxophonist who has performed with many OZ legends including Dale Barlow, Katie Noonan, Sam Anning Paul Grabowsky and John Hoffman to name just a few. In 2009 Zac won the National Jazz Award and in 2012 was a Freedman Fellowship finalist. A truly unique and distinctly Australian saxophonist, composer and improviser, Isaac plays with a strength and passion steeped in the jazz heritage of John Coltrane, Wayne Shorter, Steve Coleman and Archie Shepp. He is renowned for his work inspiring work with Elixir and his robust playing on the highly acclaimed debut album Exordium featuring his adventurous original work. Pianist and composer Sophie Min is a rising star in the Australian Jazz scene. Completing her studies at Queensland Conservatorium, Griffith University Sophie received a BMus in Jazz Performance (2014) and Master of Music Studies (2016) and was recipient of the Scott Harrison Scholarship and Postgraduate Owen Fletcher Performance Award in 2015 and was awarded an Academic Excellence Award the following year. She has attended Centrum Jazz Port Townsend Workshop in Washington and Barry Harris Jazz Workshop in New York, and studied with Kevin Hays and Randy Ingram (2016). In 2015 Sophie toured with the JM Jazz World Orchestra to Belgium, Germany, Croatia, Switzerland, Netherlands, Italy and Denmark. She has performed and collaborated with many outstanding state ensembles including the Queensland Youth Symphony Orchestra, Queensland Pop’s Orchestra and Queensland Wind Orchestra and renowned artists including John Hoffman, Kristin Berardi, Rafael Karlen and Sharny Russell. With her own trio Sophie has performed at the Brisbane International Jazz Festival, Queensland Performing Arts Complex, Jazz Music Institute, Brisbane Jazz Club and numerous Brisbane City Council Projects. This year BIJF is pleased to announce a Fully Transferable Festival Pass providing access to all 4 concerts at the Queensland Multicultural Centre (QMC), PLUS attendance to the Gretchen Parlato vocal workshop.